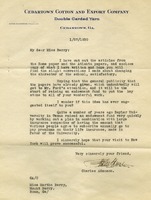 Martha Berry asks Mr. McKoy to arrange to have the pictures of Berry's new buildings which were published in The Atlanta Constitution sent to her along with a reprint of the editorial, unless the type has already been knocked down. 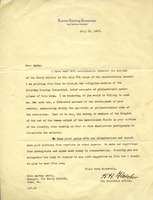 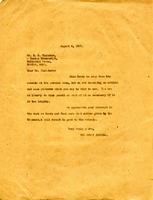 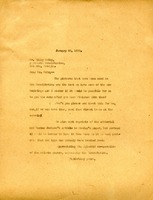 Mr. Fletcher asks Miss Berry to send a 1000 word document emphasizing the spiritual or philanthropic side of the schools, as well as some photographs, for an article in the Boston Evening Transcript. 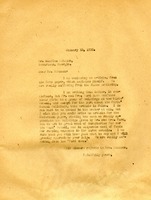 Although Miss Berry is away, an article and photographs are enclosed for Fletcher's use in the Boston Transcript. 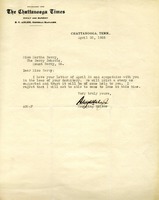 Ochs agrees to Berry's proposal of a story about the school in The Chattanooga Times, but regrets that he will not be able to visit Rome.